Tag Archives for " back forty "
Today I am bringing you another quote from The Back Forty archives. Take a moment to read through it and, as always, I’ll see you on the other side. First and foremost, if you don’t know what we mean when we say “Back Forty” take a moment to click here and learn what “Back Forty” really means. Now that we have that sorted out, let’s look at the quote. As we move into (and through) midlife, it is important to do an inventory of where we are and who we are in terms of unique gifts and talents. You might think, “I’m a parent,” “I’m a husband (or wife),” or even “I’m a [fill in your job position here]“. But here at The Back Forty we want to dig deeper.Everyone has gifts and talents. But when was the last time you actually took the time to take stock of those gifts and talents? What have you learned by working your way through all of your current and past roles? Why are we where we are at this current point in time? What brought us here? And most importantly, what are the gifts and talents that I’ve picked up along the way? There’s always a next level up we’d like to see in our lives. More fulfilling career. Greater experience of relationship. Improved health and well-being. Fit finances. Ability to contribute and make a difference. Something to aspire to. It’s the hanging in until we reach the prize that presents the rub. A personal area for me has been the development of valuable content and offering helpful ideas to others in a social media world of lots and lots of noise. You can’t look at Facebook without being barraged with sponsored ads. Since more people are online vs in front of the TV as in the past, the online world is busting at the seams with advertising. So, bringing a new and innovative message out inside a room of louder and more experienced mouths presents its challenges. We all know the story of Abraham Lincoln, and how many supposed “failures” he had to rack up before becoming President. We all know how many “failed” light bulbs hit the waste bin before one burned for Edison. Throughout history, there are countless examples of how endurance paid off. This is what I remind myself. Yet, when the seeming “Fail” button lights above any of our dream endeavors, what will make up the rope to keep us climbing? One strand might be the palpable and visceral depth of the desire…which we don’t diminish just because we haven’t gotten there yet. Can you imagine if Lincoln or Edison had made it mean something about them when they hadn’t “succeeded” yet? If either had gone the route of beating themselves up or just figuring that they are a loser, what would our lives look like now? 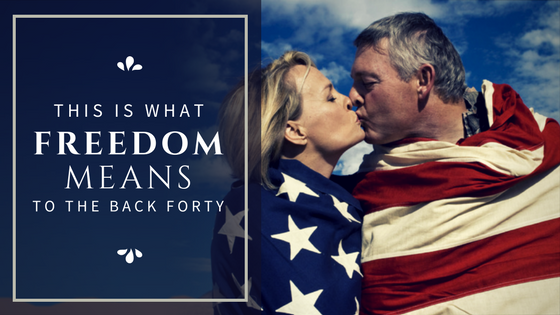 In The Back Forty, we say “you have yet to do what you came here to do”. If that’s the bandwagon you want to ride with us, then it means you must put all your past assessments of yourself and what you’re capable of where they belong: in the past. A desire rooted in infinite possibility, vs already-decided determinations of our capabilities, is what will pull us. Another strand might be the mindset that all of “this” is simply what there will be to look back upon after having succeeded. Remember: lost elections, dud bulbs. Rather than looking at each “failed” attempt as an actual failure, what if it’s all research and development? In The Back Forty, we actually propose that the whole first half of life is only R & D anyway, giving us laboratories and experiments so as to develop our own Formula of Unique Self Expression (FUSE). So, with our past behind us and only research and development continuing ahead of us, we are unlimited in what we can truly accomplish. Doing something because we love to do it, growing in the face of adversity and challenges because there’s no more fun game to play…those emotions keep us engaged. If what we’re doing – whether we’ve found the “secret” to achieving our goal or not – is having us grow in the ways we want, there’s value. Regardless of the “results” showing up yet, if we’re whistling while we work towards our dream, the tune and tone of success is present. So, I’ll keep enJOYing my Self as I put out my message, learning better ways to do it, and know that, if the intention to contribute is pure, the light developed in this lab will eventually burn for others too. How will you braid your own rope to pull toward your next level up? If you’re here to play a yet bigger game – no matter what you’ve accomplished thus far – it will take you learning, growing, enduring and enjoying in new ways and mindsets. Our 3-Day Back Forty INFUSE Program Ignites a New Formula of Unique Self Expression within you so that you use your entire first half of research and development to point you toward a playful, passionate and purposeful second half. Check out The Back Forty INFUSE Program and join us for our next course on August 18, 19 & 20th here in Los Angeles. Use Coupon Code “SUMMER17” at checkout to receive a $200 tuition discount before June 30. 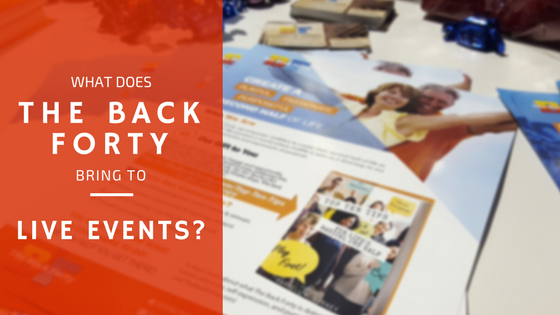 What Does The Back Forty Bring to Conferences? Recently, The Back Forty went to their first conference where they participated as an exhibitor. Scroll through the images below to get a feeling of what it was like in our booth and what we brought to the conference. Curious about what we learned at the event? Check out our previous post about our experience by clicking HERE! What Would You Do If Your Future Held INFINITE Growth Potential? Today I bring you another quote from The Back Forty archives. Take a moment to read it and then meet me on the other side as I unfold the meaning it holds. 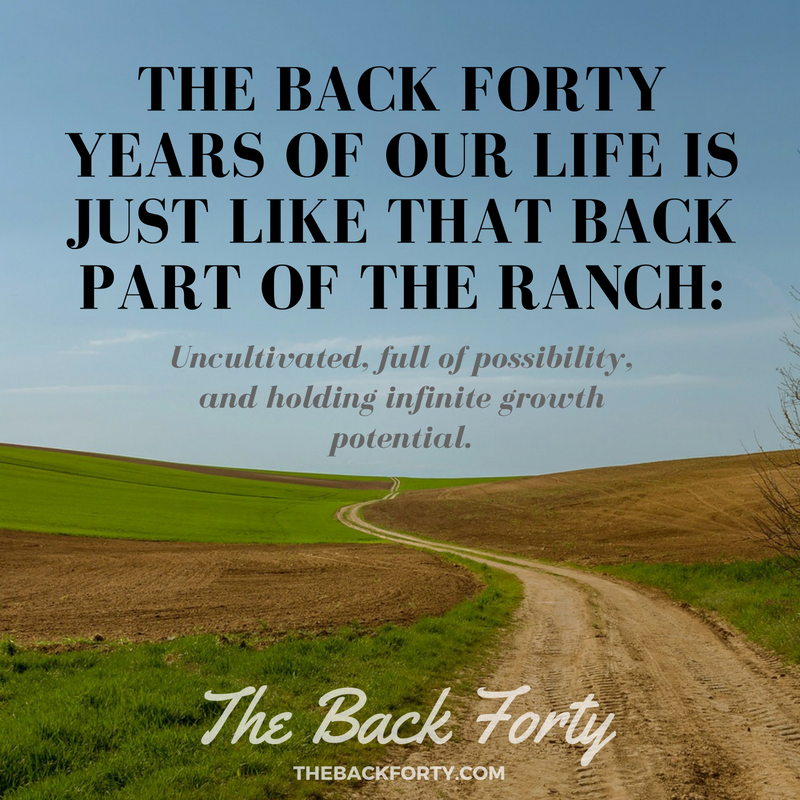 First and foremost, if you’re asking what the heck the “back forty” of the ranch is – check out my previous post on that topic by clicking here. Great! Now that we have that out of the way, let’s look at the quote. It isn’t often that we think of our second half of life as being “uncultivated”, “full of possibility”, or holding “infinite growth potential”. After all, when we think of our second half of life we usually think of things like slowing down, predictability, and stability. But, if you actually take the time to think about it, it is all of those things that we think it is not. It is a new adventure waiting to unfold. It is a chance to use all of your knowledge from your first half of life to create whatever you want for your future. It is entirely in front of you. In this way, your life IS uncultivated, full of possibility, and holding infinite growth potential. So take a moment to think about what adventure you want to work towards. After all, it’s all ahead of you! SUPER EARLY-BIRD Discount on an Upcoming INFUSE Program! 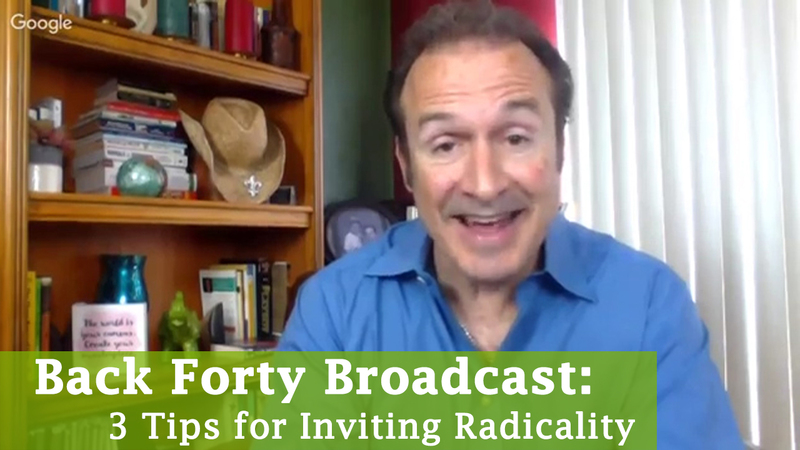 Join us for The Back Forty INFUSE Program May 5-7 in the Los Angeles/ Long Beach area. This 3-day midlife makeover will leave you renewed, inspired and ready to express your playful, passionate and purposeful second half of life. In the Back Forty, we say that you have yet to do what you came here to do. Come get clear and on track to accomplish that! INFUSE means Igniting a New Formula of Unique Self Expression. From now until midnight PST, March 31, enjoy SUPER EARLY-BIRD tuition of $597 (because we’re still picking the location). The West LA or Long Beach location will be announced soon. This discount ends when our venue has been finalized after March 31…so grab the best tuition this program will ever have! First 10 registrants get a FREE pre-program coaching session with Darrell & Alexandra! Did you miss the SUPER Early-Bird sale? Don’t worry – you can still get our most recent discount by clicking here! To get this Back Forty INFUSE SUPER EARLY-BIRD Tuition, click here. After you add the program to your cart, click “Apply Coupon” and type in the coupon code: SUPEREARLYBIRD. This will reduce your tuition to $597 before midnight March 31. 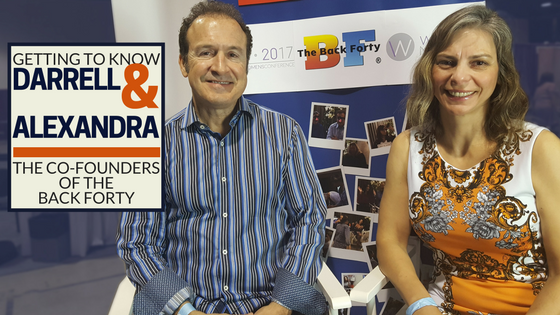 The Back Forty INFUSE Program launched in May 2015, when Darrell & Alexandra first offered their new curriculum to a small, private, pilot group over two days. The reviews and testimonials afterwards were rousing. Inspired by this response, Darrell and Alexandra then offered the program again in July 2016, expanding it by half a day to offer even more of what participants wanted and needed for this midlife makeover. Now, Darrell and Alexandra have expanded the course to three full days, to offer the most radical restart to a life of play, passion and purpose to be found anywhere. The program will take place May 5-7, 2017, again in Los Angeles. 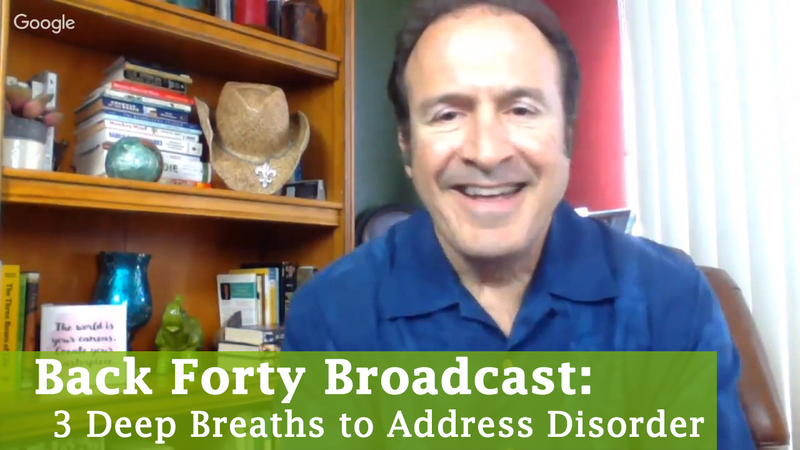 Be a part of this growing movement and community and give yourself The Gift of a Midlife Shift toward being who you came here to be and doing what you came to do. Register before March 31 and get the same tuition as those in the 2015 pilot program! Where else can you get an entire midlife makeover for the price of 100 Lattes? And this is far better for your health!